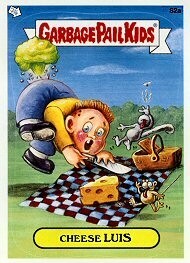 The All-New Series 1 GPK Finland set, translated to 'Kaatiksen Kakarat', was published in the early part of 2005 by Topps Europe Ltd. (Merlin Stickers), and distributed throughout Sweden by Finland by Rautakirja Oy Lehtipiste. The generic box used to ship throughout most of Scandinavia shows the SEK (17,), DKR (15,) and FIM or €? (11,? ) prices on the side for the Swedish krona, the Danish krone and the Finnish markka, respectively. 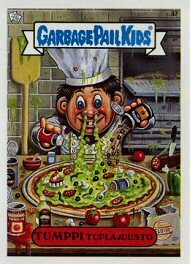 A total of one print run was released during a resurrection of 80's GPK nostalgia in the U.S. and in the UK with all-new releases. The Finland ANS1 set is a direct replication of the UK ANS and Sweden ANS sets comprised of thirty-seven images from the ANS1 U.S. set and eleven images from the ANS2 U.S. set without any A-name and B-name twin cards. The set also contains ten foil cards from the ANS1 U.S. set, but the Finnish and Swedish sets come with an additional bonus foil card that came packaged in the binder. Each paper pack contains 4 stickers, 1 foil card, and a slip of paper for a binder offer which included a free bonus foil card. The set contains the standard size of 2.5 x 3.5 as in the U.S. release. The Sweden, Finland and UK foil cards are much brighter and printed on heavier stock than the U.S. foil cards. 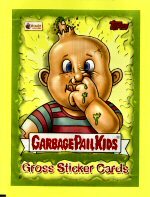 Note: this is not necessarily the first Finnish release... Topps Ireland released Garbage Gang OS2 and OS3 sets after the GG'91 UK test set within the Nordic countries of Norway, Sweden and Finland. 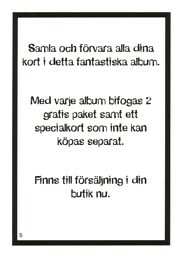 The 'Norway' packaging (box and wrappers) contain text in both the Swedish and Finnish national languages. Thanks to collector Henry Mora for box codes and pricetags and additional box and album information. 1. 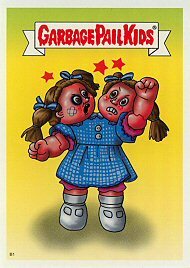 The PATTY Putty / Muggin' MEGAN character on the front side and Double HEATHER / Schizo FRAN character on the back side Bonus Foil Card can be acquired through the 'Binder Offer' slip found in every pack. 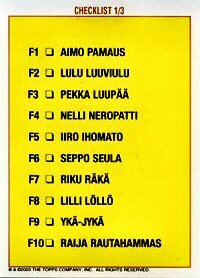 This B1 card, with no nomenclature, are two characters not used within the UK release and is a special card for the Finland and Sweden sets. 2. 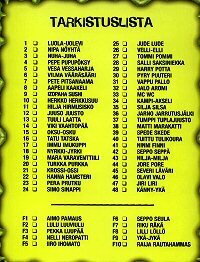 The Finland Card #29 has the same name as the Swedish card #29 HARRY Potta. 3. 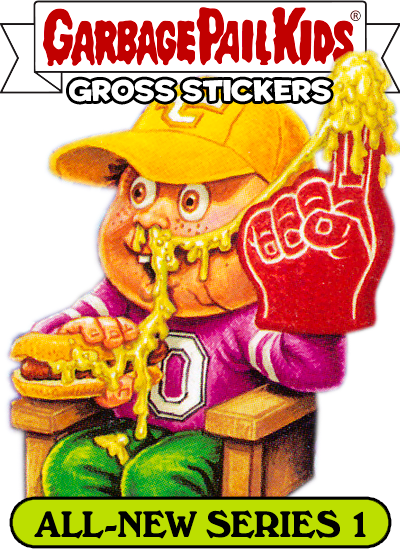 The set contains Three Scratch 'n Stink chase cards from the ANS2 U.S. set placed within the set as regular cards without the scratch and stink affect. All three have slightly different variations from the original cards. The same occurs in the ANS1 UK and Finland releases as well. 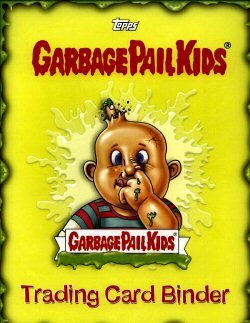 red GPK banner changed to a blue, gas cloud placed in back of the changed GPK banner and yellow nameplate changed to a light-green color. 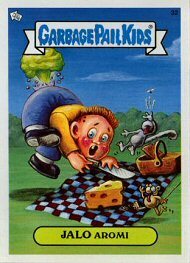 red GPK banner changed to a blue, image shifted slightly upwards (head now behind GPK banner) and light-blue nameplate changed to a dark-blue color. 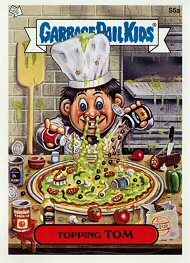 chef's hat placed in back of the GPK banner and image shifted slightly to the right and upwards. 4. 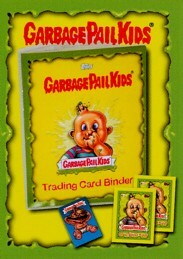 As with the UK release, the set has the PEEL HERE arrow pointing to the edge of the card where the entire face of the card is the sticker whereas in the U.S. the cards contain die-cut stickers. 5. The set contains a three-part Checklist: section 1/3 containing the nomenclature for the foil cards, section 2/3 containing the nomenclature for the first twenty-four cards (numbering 1-24) and section 3/3 containing the nomenclature for the last twenty-four cards (numbering 25-48). 6. The Puzzle Borders have no white outline like the U.S. puzzles from the ANS1 release; the fivepuzzles have a solid colour border. The foil card backs contain the 'Completed Puzzle' images. Numerically, the first nine cards of the set consist of the first puzzle, the next nine cards are the second puzzle (and so on through card #45 for the five puzzles) and the last three cards in the set contain the three different checklists. 1. 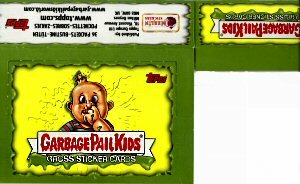 The release consists of Artwork from the ANS1 U.S. and ANS2 U.S. sets. Forty-seven images from the ANS1 U.S. set and eleven images from the ANS2 U.S. set. Please see the 'Comprehensive Checklist' below for more information on which image came from which set. Besides the name changes, this release is a direct replication of the UK and Finland ANS1 sets.